I want to reiterate this point because it reminds us of a fundamental, but often overlooked, truth. The martial arts, as they exist today, are a fundamentally modern phenomenon. For all of the rhetoric of “traditional culture” and “ancient customs,” the truth is most of the arts of Japan and China that are actually practiced are a product of the late 19th or early 20th century. They survive and thrive today because at least some of the tactical and cultural issues that they were attempting to address at that time are still problems that we face today. The feeling of vulnerability in the face of social decay, or the need to find a means of self-actualization in an increasingly hostile world, are not problems that any one culture has an exclusive monopoly on. That is good news for students of the traditional fighting arts. It means that we can find new ways to adapt and stay relevant. 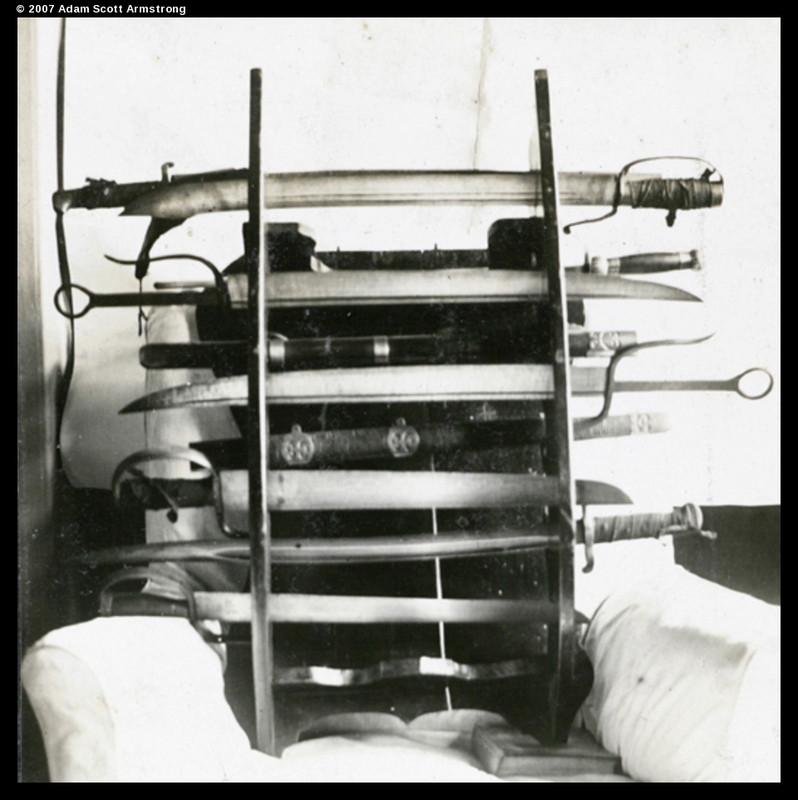 The first rack of weapons, seen above, contains four heavy sabers. Three are ox-tailed daos (niuweidao), and the fourth has a clipped blade very much resembling the dadao which was just starting to rise in popularity among civilians. All four of these swords appear to be the sort favored by street performers and public martial artists. I suspect that this is exactly where they came from. Martial arts performers were often viewed as a public nuisance and were subject to a fair degree of police harassment. There is also a very nice set of shuangdao in this collection. The blades look practical and the hilts appear to be well made. This is the first of many sets of paired weapons that will appear in these photographs, perhaps indicating something about their popularity with local martial artists and criminals alike. The second set of swords is slightly more interesting. Here we see a selection of shorter swords and jians. 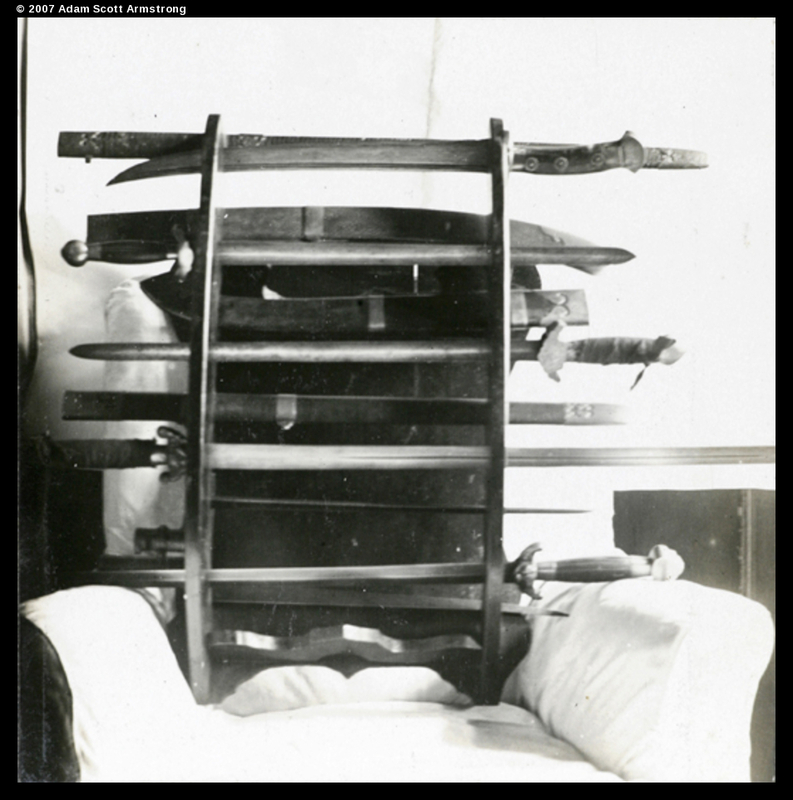 These straight, double edged, swords were also a type of weapon favored by martial artists. One can still see Taijiquan students practicing with these sorts of swords in pretty much any public in China (and quite a few in the west). The second lowest Jian has an exceptionally long blade, and all of the swords look heavy and functional. The bottom example also appears to have a finely worked guard. Hidden behind the other weapons at the bottom of the rack are two thin blades. I suspect the lower example is attached to one of the more rapier like examples of a hudiedao. Above that is the thin triangular blade of a rifle bayonet. From my perspective the third rack of weapons is the most interesting. 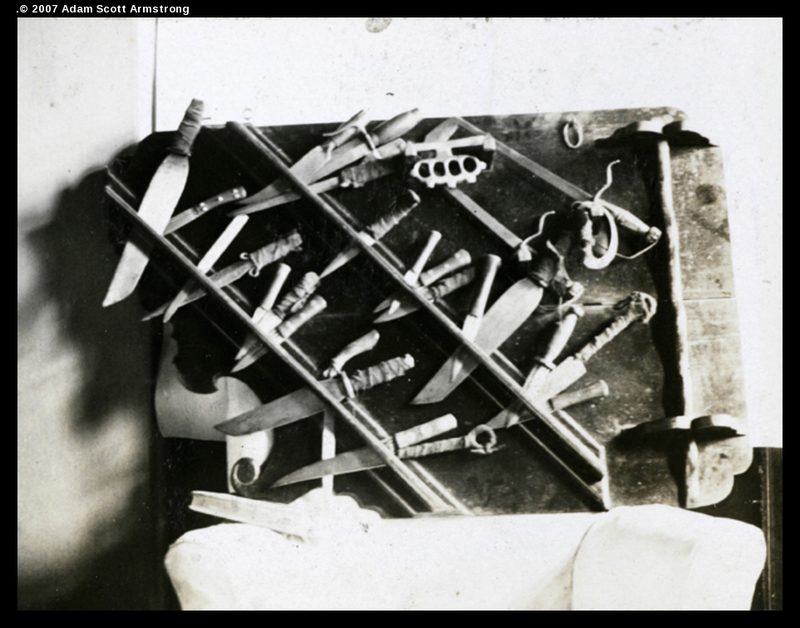 These are blades that look more like weapons than the confiscated props of martial arts schools or street shows. A number of these blades appear to have hand guards. In fact, that seems to be the reason that they were grouped together by who ever assembled the display. The topmost blade is in a configuration that is not often seen today, though I suspect that swords like this were more common in the 19th century. I particularly like the two ring-handled sabers. 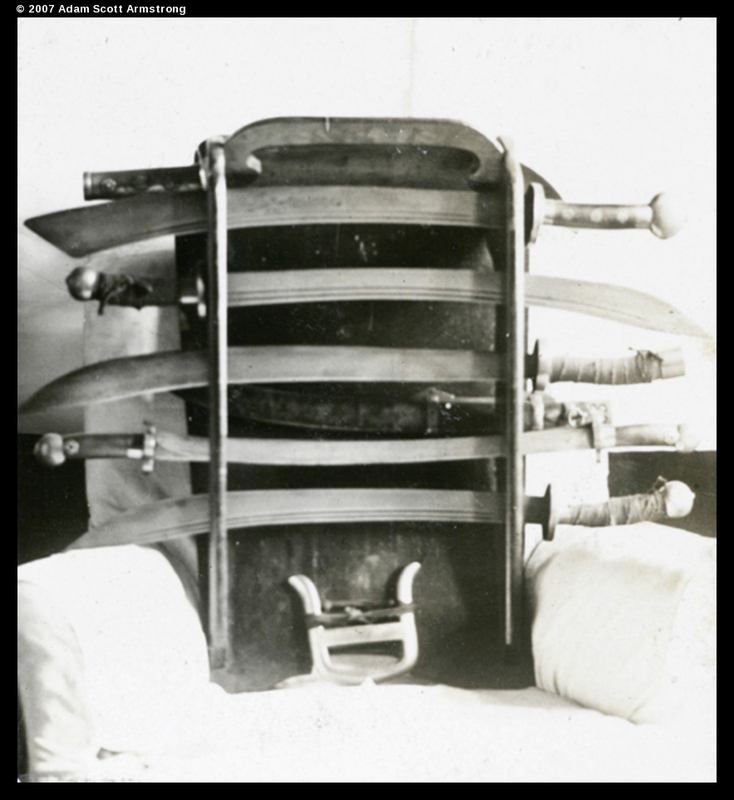 These swords were evidently intended to be used as a set and were about 15 cm longer than the hudiedao below them. That would be a very good length for practical fencing, and the blades look as though they would be devastating slashers. The Hudiedao (butterfly swords) have heavy choppy blades and thick brass hand-guards. These are much longer (and more practical) than sorts of butterfly swords that are favored by martial artists today. The hatchet point is a common design feature and suggests that the creator wanted a strong stabbing point. These swords are very similar to ones that date to the mid to late 19th century. While Hudiedao were originally popularized in the south, by the 1920s and 1930s they had spread across China. We normally think only of northern martial arts masters spreading the craft to the south. Yet the presence of these swords is mute testimony to the fact that exchange of “practical ideas” in the Rivers and Lakes was often a 2-way process. Careful observers will also note not one but two Yataghan style bayonets. Given that there are multiple pairs of “double swords” on this rack, one wonders if their original owner also intended to use them as a set? 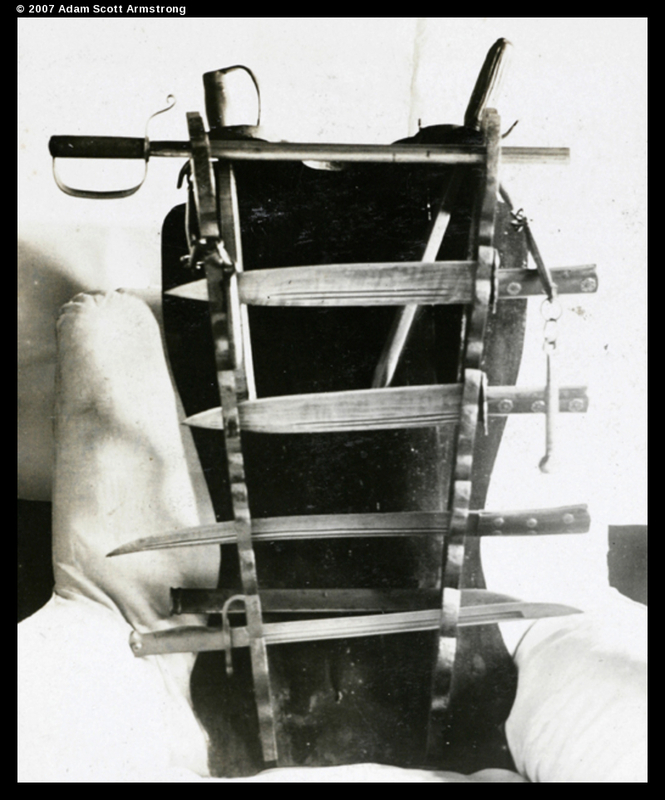 With a ready supply of cheap surplus bayonets after WWI, I had always wondered why various martial artists and criminal factions did not make better use of them. Apparent at least some individuals in Shanghai had the same thought. The fourth rack displayed a collection of various types of projectile weapons and firearms. Three older revolvers are clearly visible, including one a black-powder “pepper box” design. There are also two examples of sawed-off shotguns in the display. Also worthy of consideration are three 19th century rifles that have had both their barrels and stocks shortened. One suspects that these arms have been modified to serve as single shot, black-powder, sawed-off shotguns. If so, such a weapon could be a danger to anyone in the immediate vicinity when it was fired. The most interesting feature of this display can be seen along the top shelf. Six small throwing darts have been arranged, complete with their streamers. While one frequently encounters accounts of “concealed throwing darts” in period martial arts fiction, I basically assumed that most of these stories were exaggerations or rumors. It was certainly interesting to see a collection of authentic throwing darts in police custody. The first rack presents us with a couple of puzzles. The easiest weapons to identify are a pair of very large fighting knives in the middle of the display. These look to have been about the same size as large 19th century bowie knives. Spear pointed, their blades both show a double fuller and the handles have matching ornamental rivets. Evidently this set of knives was made as a pair and one suspects that they may have also been used as such. Below them is a very long thin knife. Looking at the geometry of the tip one wonders if perhaps this is actually a modified sword blade. It is not uncommon to see re-purposed or reshaped blades on antique Chinese weapons today. This may be an example of that same practice. Hanging from the right edge of the case one can see the lower links and handle of a “chain whip.” Again, its interesting to see this weapon in a very different environment from the modern schools and flashy public performances where it is often encountered today. Lastly are three weapons with enclosed hand-guards. While somewhat similar in size and shape to a hudiedao, two of these are actually bar-maces. The “blade” of the third weapon is not visible, but it appears to have integrated a shallow cup into its D-guards, much like a European small sword. The final weapon is yet another WWI era bayonet. This particular model is long enough that it could have served as a short sword. Last we have a large assortment of much smaller knives. A couple of these have the coffin-shaped blade that is often marketed in the west as a “River Pirate Knife.” Apparently the more urban, and less nautical, toughs of Shanghai also employed the weapon. A number of ring-handled daggers can be seen in the display. Forms for this particular weapon (often used in pairs) are common in the Northern Shaolin styles, so it is useful to see some period examples. Smaller double edged daggers and throwing knives also appear to be very common. This display presented two other oddities. There is a set of “brass knuckles” at the top of the display. To their right is yet another pair of modified hudiedao. These have very long, thin, rapier like blades. The hook shaped quillion at the back of both blades has been intentionally straightened out. In this shape it would be impossible to “catch a blade,” but they likely afforded better protection to the users hands and wrists. My Sifu and I have suspected for some time that this was actually the original function of the quillion. Many older hudiedao actually have very shallow “hooks” (no good for trapping), which lends some credibility to that theory. Perhaps the idea of using the quillion to trap or encumber an opponents blade came along later. Nevertheless, a basic understanding of the principal of leverage will reveal that even if one can pull the maneuver off, its not without its risks. Strongly hooked quillions also have a tendency to get caught on one’s own clothes and other unintended targets. I have seen examples of the knives where the quillions were cut short or removed. Apparently the original owner of these knives had a different solution to the problem. Conclusion: Traditional Weapons in a Modern World? The forgoing collection should help to clarify our thinking on a few points. 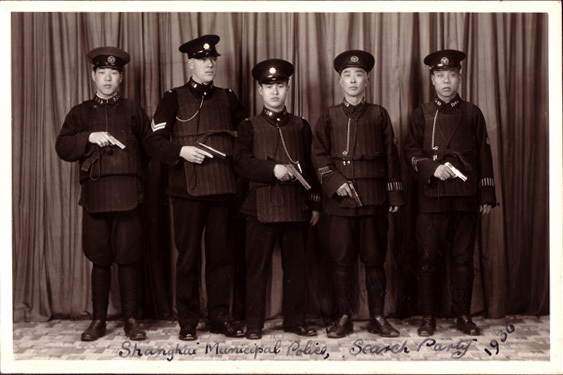 To begin with, its interesting to see what sorts of traditional weapons were showing up on the streets of Shanghai in the middle of the 1920s. Knives of various lengths and styles appear to have been very common. A surprising number of short swords and hudiedao also make appearances in this collection. However, aside from some bar-maces and a chain whip, many of the more exotic Kung Fu weapons are notable by their absence. A certain western influence was also detectable in the bladed weapons of Shanghai. A few of the knives were crafted in what appeared to be a more Western style. Further, western military bayonets made repeated appearances throughout the display. The brass knuckles also appear to fall into this category. Obviously this speaks not just to the Shanghai’s role as a gateway to the world, but to the rapidly globalizing nature of the Chinese economy as a whole during the early 20th century. These photos also help to build up our basic knowledge of the milieu that the Chinese martial arts came of age in. While we tend to divide weapons into “traditional” and “modern” categories, that may not be entirely appropriate when thinking about their use in the late 19th or early 20th century. To the individuals who carried these weapons, they were not “traditional knives” or “traditional swords,” they were simply knives and swords. It sometimes surprises us that these weapons remained in use in an era dominated by firearms, but the nature of crime itself often provides openings for these sorts of weapons to not just survive, but excel, long after they are no longer used on the military battlefield. About a year ago I was looking at some FBI crime statistics for my Sifu and was surprised to see that knives and blunt instruments are still the cause of death in a very large percentage of deadly attacks in the United States today. Apparently the ready availability of shotguns and revolvers has not made the baseball bat “obsolete.” Similar processes seem to have been at work in China in the early 20th century. Once again, the more things change…. 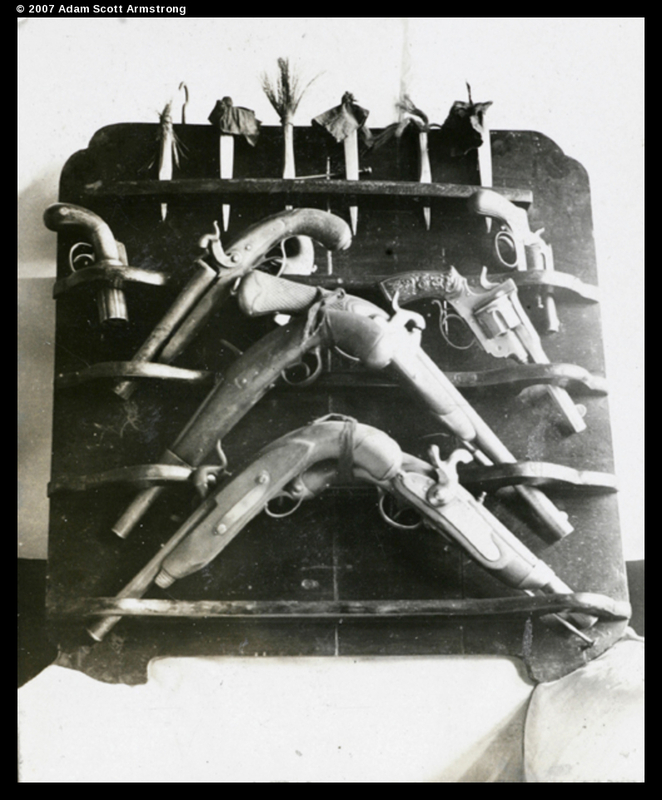 Luckily I have discovered some older law enforcement records (from the 1870s) that paint a much more complete picture of the sorts of weapons that gangsters and criminals from Southern China actually carried. Of course the 1870s is a critical time in the formation of the southern martial arts. Styles such as Wing Chun, Choy Li Fut and Hung Gar were all going through important transformations in that decade. That makes it all the more important to know exactly what sorts of weapons a martial artist from this period might actually expect to encounter. An exploration of that data will be the subject of an upcoming post. Random thought: I was looking for the precursor of the Fairbairn-Sykes commando dagger, since the 1920s and 1930s was when Fairbairn and Sykes were getting their martial education in Shanghai. There are definitely some contenders in that last photo, which lends credence to the notion that they adapted the commando dagger design from one used by street gangs in Shanghai. Another random thought: the authentic tai chi dao has an S-guard and a ring hilt, and that type is visible in the third plate. Similarly bagua uses oversized jian and dao, and one might argue that double-length jian is an example. Not that I’m saying that these weapons were necessarily confiscated from tai chi and bagua practitioners, but it’s interesting to see styles that are routinely thought of as cultured and northern showing up in the south. Great thoughts. I had debated talking about the Fairbairn Sykes angle but decided that this post was already too long to open up that conversation. That topic is going to have to get its own blog post one of these days. But yeah, I totally agree. A couple of those blades are highly suggestive of future developments. I agree. Shanghai was a real mixing pot. And it helps to illustrate that in the 1920s and 1930s there was a lot of movement by martial artists and their styles. That is actually one of the things that I find most interesting about martial artists in a number of time periods. Even though society as a whole tended to be very static, these were people who could travel. What they saw or experienced often brings a slightly different perspective to our understanding of Chinese history. Hi I;m looking to Fairbairn Sykes knife history and it lead me to here. First I thought it was Fairbairn & Sykes own design but later I found there is one of Western Shanghai Municipal Police from US, first close combat instructor to U.S. Special Forces Unit, friend of Fairbairn and Sykes too. He later give advise to V-42 stiletto knife design which is based on Fairbairn knife. This proof is Fairbairn and Sykes know the design as this U.S. Instructor too. They get the kungfu trainingg from “Tsai Ching Tung” an empress of China bodyguard (the last). The design of this famous Fairbairn Sykes knife must be originated from this “Tsai Ching Tung” or Shanghai Municipal Police. Interesting to see where the art meets the practical. Regarding the Fairbairn connection, I believe the famous commando knife was based on a smaller stiletto he designed and experimented with (!) in his Shanghai days which he called The Shanghai Knife. Regarding the straightened quillons on the butterfly knives in the final photo: Quillions were quite a feature of western swords, and rapiers in particular, and I’d like to share my insight from that arena. Some rapiers (and their associated daggers) had long straight quillions, while others had hooked quilions. There was no one right or wrong way to use them, rather differing techniques to suit different fencers. For some, regardless of the shape, they were passive defensive structures, while others would use them to aggressively trap an opponent’s point. However the reason they were hooked wasn’t always for trapping, but rather simply for stopping a parried blade and holding it in place. And even in the case of using the hook to trap a blade, the defender risks having his weapon wrenched out of his hand by an aggressive attacker, or one with a longer or heavier weapon.